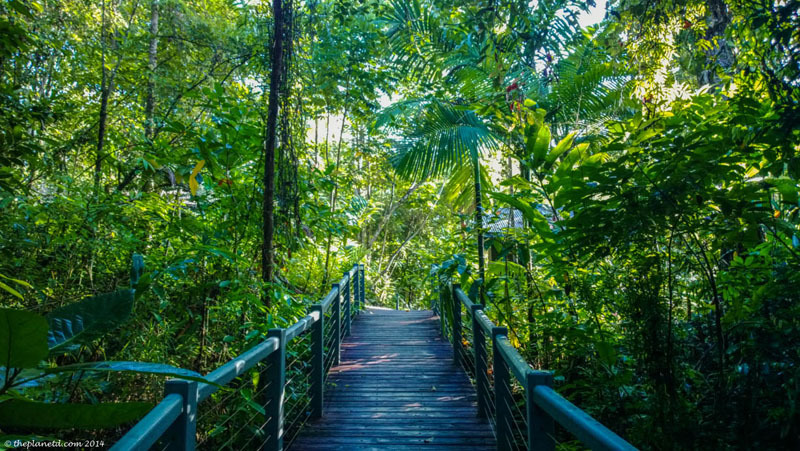 When entering the Daintree Rainforest, of Queensland Australia, one instantly feels transported to another world of luxury. Especially when staying at Silky Oaks Lodge. 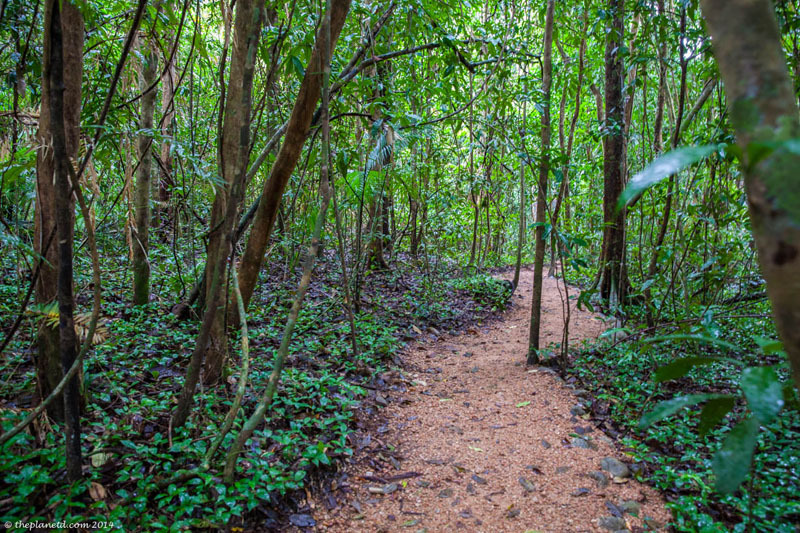 One minute you are sipping an icy cold beer in the developed yet mellow beach town of Port Douglas, and the next you have entered the oldest surviving rainforest on earth. The Daintree Rainforest is 180 million years old covering an area of 1200 km. Walking through the ancient forest with our Indigenous guide from the Kuku Yalanji Tribe gives the sense of being in an exotic unexplored land. We met Harold (Aka Mooka) at the Mossman Gorge Visitors Centre where we caught a bus to the entrance of the gorge. While others got off at the regular paths open to visitors, we were part of a group doing the guided Dreamtime Gorge Walk. This land is sacred land and unless you are with a member of the Kuku Yalanji, you are not allowed to enter. We had to take part in a smoking ceremony before beginning our walk, so we followed Mooka around a smoldering fire to keep spirits and spells away. There are spirits within this forest and Mooka must ask permission to bring us along. During our 1 1/2 hour walk, we learned about plant life, medicinal healing and an ancient way of life that has been passed on from generation to generation. Mooka grew up with his grandparents in this forest. He was chosen over his other brothers and sisters to join them and learn the ways of his elders. He tells us that many people have come to him for healing. He has cured many ailments even when it seemed that all hope was lost. 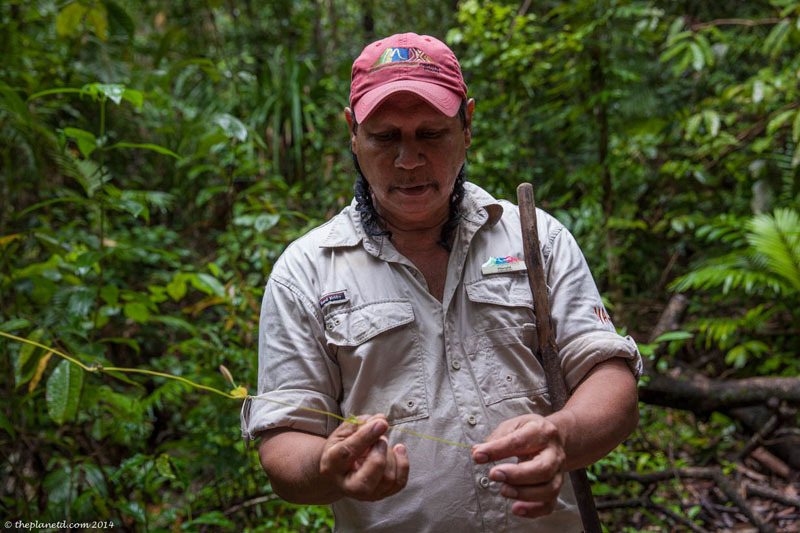 Everything you need to survive is in the rainforest. He knows which plants can cure a fever or give you energy. But as much as the forest can heal, it can be just as deadly. He's been a medicine man for 38 years and he is living his destiny. His grandfather had a vision that he'd be in a teaching position as an adult and here he is, teaching us the ways of his ancestors and the indigenous way of life. 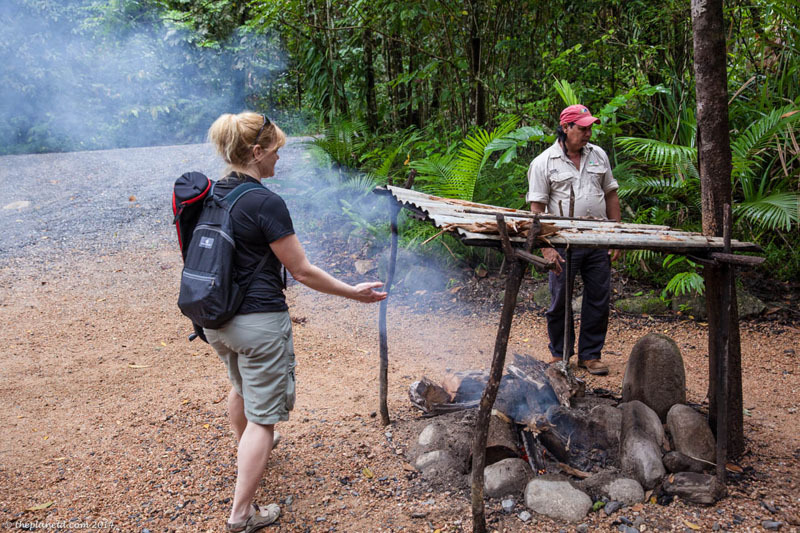 The Aboriginal people run these tours and it is an amazing way to learn about their history and their culture. It gives precious insight into a way of living that we barely understand. We were staying a mere 10 minutes away from Mossman Gorge at the serene and luxurious Silky Oaks Lodge. It was the perfect setting to explore the rainforest as it is built within a rainforest setting itself! The property winds through jungle paths leading to contemporary treehouses located on the Mossman River. 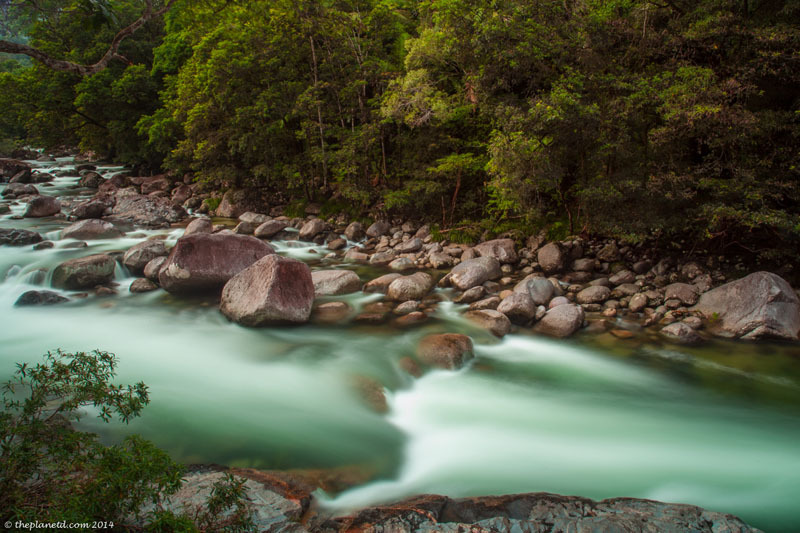 The Mossman River is a freshwater river fed from the mountains so you can swim freely without fear of crocodiles. The moment you enter Silky Oaks, you feel relaxed. The open sides Treehouse Restaurant looks over the meandering river into the jungle. You can hear the life around you as you enjoy a freshly squeezed welcome juice while lounging on lounge chairs. It is here that you can while away your days doing nothing but sitting by the pool designed to look and feel a part of the jungle. There are many activities offered as well including yoga, snorkelling, and kayaking at no extra fee. Or you can simply walk through jungle paths or enjoy an outdoor picnic on a sandy beach by the billabong. Our deluxe treehouse lodge suite was set up beautifully for our arrival with welcome champagne and the soft sounds of the rainforest playing on CD. We had the option of sleeping indoors or out on a four post king size bet and we could sit and read a book on our two comfy day beds while enjoying our assortment of teas and coffees supplied for our pleasure. The room was so elegant and inviting, we almost didn't want to leave. 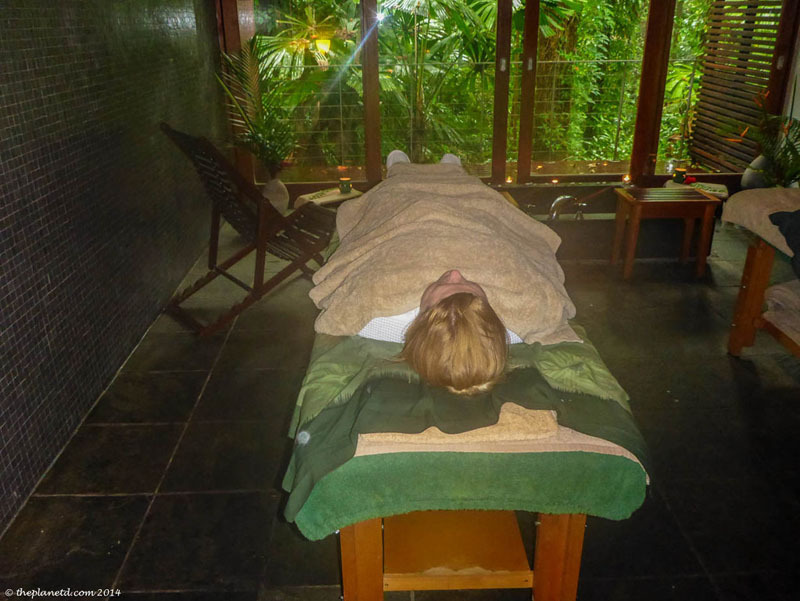 However, Silky Oaks doesn't have the name spa for anything so we pried ourselves away from napping and relaxing to get even more pampering in The Healing Waters Spa. Dave has grown accustomed to spas over the years and while 5 or 6 years ago I'd never get him to walk into a spa session, he now looks into them wherever we go. And I like it too! I decided to have a facial today as we had spent the winter outdoors in Canada and my skin was suffering. 60 minutes of cleansing, exfoliating and moisturizing revitalized my face and helped calm my skin. I had been suffering from acne on my chin since December because of what I assume was constantly wearing a buff or face mask to keep my neck and chin warm. Within a couple of days of my facial, the blemishes disappeared! Dave went for The Soul to Soul treatment where his scalp arms and shoulders were massaged with aromatherapy to relieve tension. It's called a Soul to Soul, because when the upper body was finished, the feet and legs were massaged to increase circulation and reduce swelling. Once we were finished our treatments we were both a gooey mess of jello. But that was ok, because we were in the right place for it. At Silky Oaks, everything you need is at your fingertips. With fine dining in the main lodge, the chef uses local produce to create modern Australian cuisine combined with a fusion of Asian and Mediterranean flavours. Water is fresh from the Mossman River and treated on sight and the entire lodge is eco-friendly taking care to blend seamlessly with very little impact on its jungle setting. It is truly the perfect base for exploring all there is to see and do in the Daintree Rainforest of Tropical North Queensland. 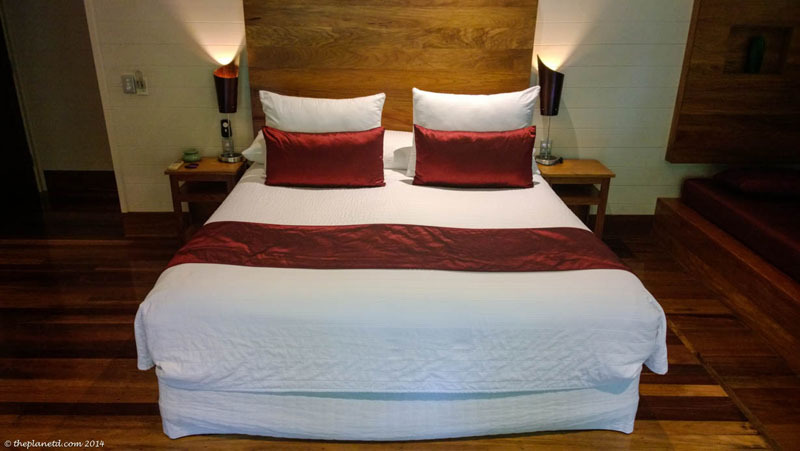 Silky Oaks Lodge is located adjacent to the Daintree Forest approximately 25 minutes from Port Douglas and 10 minutes from the Mossman Gorge where Dreamtime Walks can be booked starting at $50 per person. 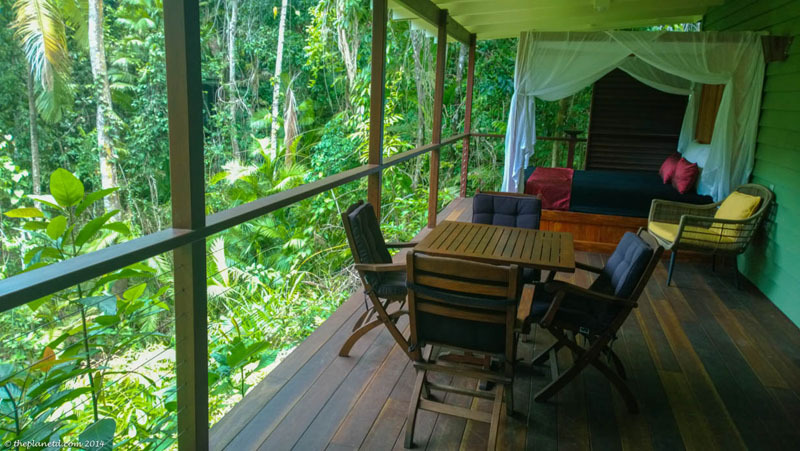 25 Responses to "Daintree Rainforest Dreamtime at the Silky Oaks Lodge"
The rainforest looks beautiful! What a unique experience too to learn about and with the Aborigines. Thanks for sharing! Glad you already heard of Silky Oaks, it’s pretty incredible. Don’t worry, you won’t come across the paralyzing plant, this was in a part of the rainforest that was cut off to tourists unless you were with a local guide. I think the rainforest around Daintree is just fine. They encourage you to go for walks and tell you that there’s nothing that can hurt you out there. Nice! Oh all your photos and talk of Queensland is making me so eager for my trip! I scheduled a “dreamtime” aboriginal walk too.. wonder if it’s the same! Cheers & happy travels. 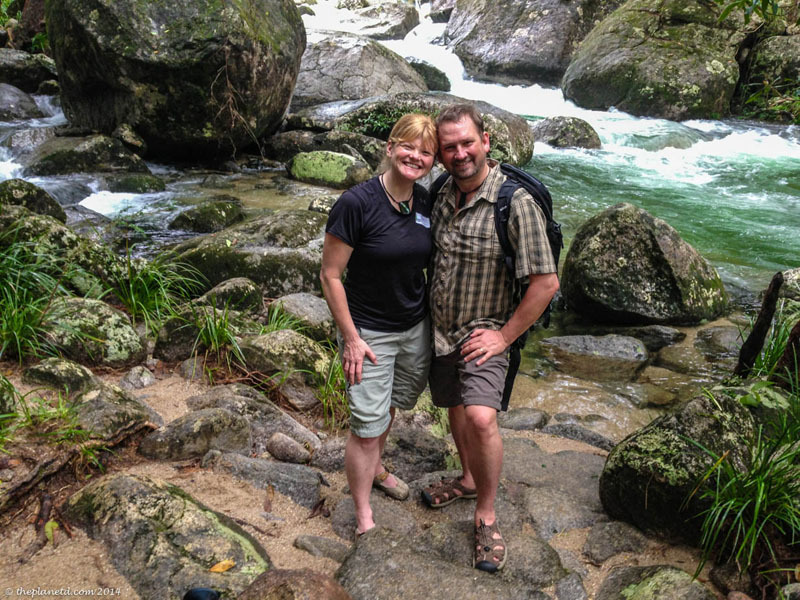 Are you doing your dreamtime walk at Mossman Gorge? If so it’s probably the same. Have an amazing time on your trip to Queensland, you are going ot love it. We do love to spoil ourselves. I think that wherever we go now we try to get some sort of spa session in. It’s one of the few moments in our lives that we can really turn off our brains and let go of all the stress the things that need to be done. I think it should be offered in medical coverage. The health care system would have less of a burden on them if more people had the chance to pamper themselves every once in a while. Stress is such a huge part of health issues and this always melts it away. Beautiful pics, especially the one of Mossman River. Silky Oaks Lodge looks lovely too! Thank you! Silky Oaks is extremely lovely. We couldn’t believe the tranquility and beauty when we pulled up. It’s one of those places where you say to yourself, I get to stay here? I have to stay at Silky Oaks Lodge, it would fit my idea of relaxation perfectly. Your pictures are fabulous and the one of you two is what I refer to as “a framer”. I love environments like this – awesome! Looks gorgeous! 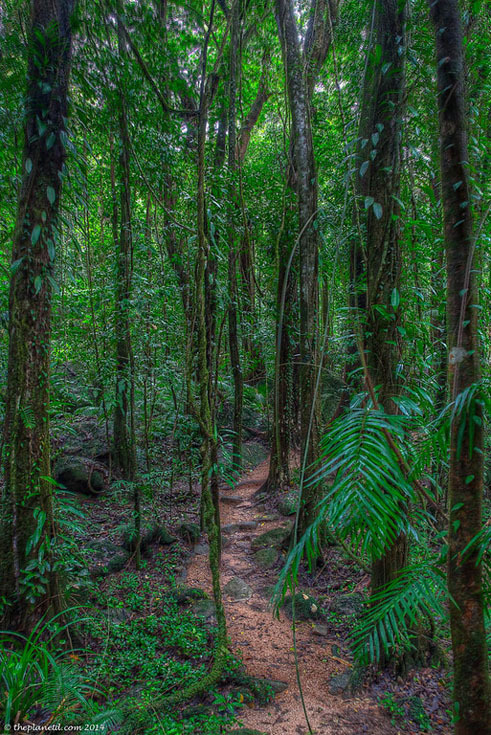 I took a rain forest tour near Cairns about 4 years ago that was lots of fun, but definitely nothing like this one. I certainly don’t remember any potentially paralyzing plants! Scary! I almost wonder if he was pulling our leg. He seemed so relaxed about it all. but we tend to believe our guides and he didn’t say it with a smile. Maybe I’m gullible, but it is Australia after all right? Looks very inviting. I think I had read about Daintree rainforest sometime back. Your pictures look serene and beautiful. Thanks Renuka, you have probably heard of it before. I think it is a popular stop when visiting the tropical north portion of the country. The Daintree Forest is indeed a very beautiful and special area of Australia! We agree. Can’t wait to go back. So amazing! I’m obsessed with rain forests!!! Me too. I love the smell and weight of the air in them. It feels so alive.